University of Pittsburgh researchers have assembled a key piece of tech that will help enable a future generation of extremely powerful quantum computers as well as advanced electronic materials and better computer memories. Their single-electron transistor is the first of its kind made entirely from oxide-based materials, an important aspect that allows it to work as a solid-state memory. SketchSET—or sketch-based single-electron transistor—contains a tiny 1.5-nanometer-wide island at its core that operates with just one or two electrons at a time. The ability to work at such small scales makes it ideal for several advanced computing applications, like quantum processors that would be orders of magnitude more powerful than existing supercomputers. The tiny transistors could also enable ultradense memory that packs far more information into far less space than existing memory. But the subatomic possibilities don't end there. That tiny central island at the heart of the technology could also be used as an artificial atom, the researchers say. 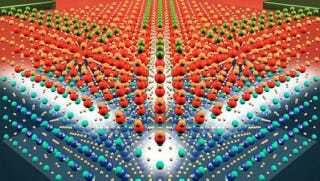 These in turn could be used to develop new classes of electronic materials, like superconductors with exotic properties not see in natural materials.